Villa Treggiaia is situated in the hills of the Chianti Classico region surrounded by 4,000 sqm of olive trees. The villa dates back to the 14th century and has been recently renovated. The villa is situated in the tiny and characteristic village of La Romola (316m) in the famous Chianti hills, about 10 km south west of Florence (bus stop at ca. 150m). 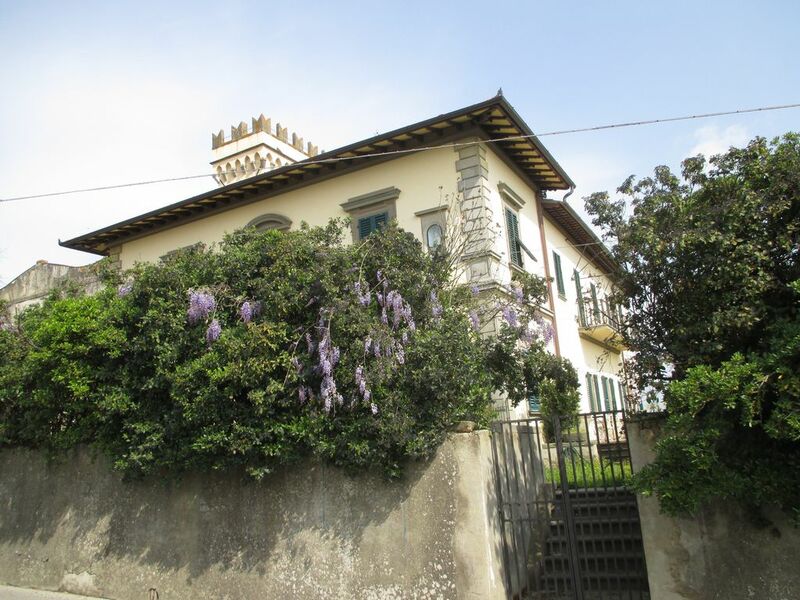 Villa Treggiaia sleeps up to 12 people, offers parking space in the courtyard as well as access to internet. The panoramic pool (open from June to September) is situated in the garden and offers a stunning view over the Chianti hills. All arriving guests are welcomed personally by Maria Grazia, the owner. Living in an apartment on the opposite side of the villa, she is always available for any of her guests’ requirements. The living area if the villa (300 sqm) includes the ground floor, first floor and a characteristic tower. The panoramic pool a few metres from the villa opens from June to September, embedded in an olive grove, offering shadowy space under the trees and the pergola as well as garden furniture. GROUND FLOOR: Outside a front yard with dining table for up to 12 people under a pergola a barbecue, inside a living room, double room, spacious kitchen with fire place, dining table for up to 12 people (oven, electric grill, microwave, dishwasher, fridge-freezer), 1 bathroom with tub, one guests’ bathroom with shower. FIRST FLOOR: Living room with characteristic coloured glass window facing the villa’s inner courtyard, spacious kitchen with dining table for up to 12 people (oven, dishwasher, fridge-freezer) and panoramic balcony, double room, bedroom with three separate beds, bedroom with two separate beds, 1 bathroom with tub, 1 bathroom with shower. TOWER: On three different mini floors are available a double room, a kitchenette (oven, dishwasher, fridge-freezer), 1 bathroom with shower as well as a small room with a single bed and a panoramic roof terrace. The village of La Romola in ancient times was a hamlet where important Florentine families built their summer residences. Today there are a post office, a grocery store and two of the typical local coffee bars. La Romola belongs to the community of San Casciano in Val di Pesa (8km). Here you will find the supermarket. The historical centre of San Casciano offers a pedestrian area with stores, bars, wineries and small restaurants - don’t miss the weekly market on Monday mornings. The natural park of Poggio Valicaia is only 2km away, an ideal space for walkers, mountain-bikers and runners. The region is world famous for its wine production, but also for its extra virgin olive oil, arts and craft. Enjoy the specialties of the typical Tuscan Florentine cuisine in the local restaurants. Many cellars offer wine tastings. Villa Treggiaia is the ideal starting point for the most popular destinations in the region: Florence is just 10km away and can be reached by bus in ca. 40 minutes (bus stop at ca. 150m. •	CITIES OF ART: Vinci (ca. 34km), San Gimignano (ca. 40km), Siena (ca. 60km), Volterra (ca. 65km), Pisa (ca. 70km), Livorno (ca. 80km), beaches at the Thyrrhenian Sea (ca. 70km), Arezzo (ca. 80km), Lucca (ca. 85km). Ask for our bike rental and excursion offers with state-of-the-art (mountain) bikes and e-bikes. We stayed for eight days in July: three family with kids ranging from 3 to 9 YO. Maria Grazia is very nice: responsive and accommodating. The house is very large with a nice garden/pool area, and plenty of common areas.The house has three kitchens, two sitting rooms, plenty of bathrooms and six bedrooms. The only hiccup is that two bedrooms do not have AC - it was very hot in July and we could not keep the windows opened at night because of the mosquitoes. Also, keep in mind that two bedrooms (a one bed and a full/queen) are in the "tower", which has a narrow staircase access not suitable for small kids. Could be very fun for bigger kids/teenagers though. The location of the house is very convenient: 20-30 min to Florence, 50-55 min to San Giminiano, 1.10h to Sienna, Piza or Lucca. There is a small convenience store in the village, and a large supermarket 15 min away. Plenty of good restaurants within 10-20 min drive. Overall, a very nice stay that I recommend (if the sleeping bedroom arrangements work for your family). We planned this trip with our adult children and significant others. The view alone made this Villa special, but the beautiful grounds with flowers and fragrance everywhere were delightful. The house is large with several bathrooms, 2 kitchens and an outdoor dining area under a trellis of jasmine. The multi-floor layout was perfect for 9 adults and a 1-year-old, and could easily have accommodated a few more. This 15th century home had frescoes painted on some of the walls and ceilings and my son claimed a little bedroom located up in a turret (with the best view) as his own. We had plenty of space to spread out as well as to gather together. We loved to come home to the pool after exploring Florence, Siena, Pisa and other ancient places. There was plenty to explore in the nearby countryside and we really enjoyed some of the wonderful wineries in the area. Maria Grazia, our hostess, made our trip wonderful from before we arrived. She helped us secure an awesome chef who cooked and took care of everything on the nights that we ate in. But don't miss pizza night in town (Sunday). We ordered out and had to go back for more. San Casciano, a walled city nearby, had one of the best restaurants we ate in on our entire vacation. We ate, we drank wine, we laughed, we swam, we relaxed and we reconnected. Villa Treggiaia is a magical place for a group of friends or a family vacation. We all are ready to go back again. Grazie Maria Grazia per una bellissima vacanza. It was a real pleasure to have you as guests and to know that you enjoyed your holiday at Villa Treggiaia. You were one of the best group of people that i welcomed in my house. I have only words of kindness an gratitude for you, because are really nice and friendly people. Thanks for left the room very tidy. i we'd love to have them back. We were a party of nine and the villa accommodated us perfectly. It is not luxurious but was very comfortable and ideally situated close to Florence and about an hour from Siena. Maria, though not fluent in English is most hospitable. The old tower on top of the villa provides wonderful views of the surrounding countryside. Highly recommended. We spent 2 weeks in Villa Treggiaia in July 2017. We had a wonderful time. The kids spent most of the time in the beautiful swimming pool. The house is big enough for at least 2 families. It is very spacious and has several bathrooms and kitchens for your comfort. The owner Maria Grazia is lovely. She is very discreet and looked after all our needs. Villa Treggiaia is ideally situated just a short distance from Florence, 45 mins from Siena and San Gimignano. The countryside is breathtaking. We took so many photos. The nearby town in San Casciano in Val di Pesa has several ice-cream shops, good restaurants, tourist office, supermarket and other shops. There is a lovely market on Mondays. There are lots of different places for wine, oil and balsamic vinegar tasting. We also enjoy walking in the countryside in the nearby parco di poggio. We had one of our best holidays in Villa Treggiaia. We stayed in the villa for a week in September a group of 9 friends. We really enjoyed our stay! The villa is huge and offers more than enough room to live in with 9 adults (even when it rains). The pool is also great with a nice view. Maria Grazia is a great host. She brought us to the local pizza night in the town of Romola on our arrival day (Sunday), because all supermarkets were closed. It was very nice to have good (and very cheap compared to e.g. Florence) pizza's and wine surrounded by locals. She also arranged a cooking class for us with a local Italian chef and a translator which we enjoyed very much. Thanks for everything! THE Romola is an ancient medieval village in the municipality of San Casciano Val di Pesa at 316m. from sea level on the highest part of a hill. The beauty of the place (we are in the famous Chianti Classico and the green park area of ​​Poggio Valicaia), the mountain climate, the proximity to Florence (just 10 km), have made this village place appreciated by important Florentine families who established place their residence. It 'a village famous for the production of extra-virgin olive oil, wine Chianti Classico, and agricultural products in general. On foot you can reach the renowned park of Poggio Valicaia for those who enjoy hiking, walking, mountain biking. A few km. We San Casciano Val di Pesa, with shops and activities of all kinds: cinema, theater, sports, supermarket, restaurants and taverns where you can appreciate the typical Tuscan cuisine, drink fine wines, buy local products and local crafts. Il prezzo comprende elettricità acqua gas biancheria da letto e biancheria da bagno (set iniziale) manutenzione della piscina connessione ad internet parcheggio all'interno della proprietà da novembre a marzo è richiesto un supplemento per riscaldamento di € 15 al giorno da pagare all'arrivo. The price includes • Electricity • water • gas • parking • pool maintenance of swimming pool • Internet connection From November to March is required for heating € 15 for day payable upon arrival.